A professor at Hoa Sen University in HCM City who shot to fame when he taught a class on innovation wearing a pair of shorts has come up short at the hand of some bureaucrats’ rigid interpretation of regulations. The professor, also famous for encouraging students to think outside the box, was chosen to fill the vacant position of the university’s chancellor by its board of directors, but the municipal education department vetoed the move, citing a “lack of experience”. 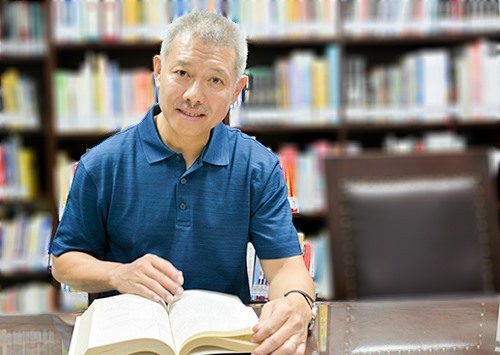 Dr. Trương Nguyện Thành has since decided to part ways with the university, returning to a position he held earlier in a prestigious school in the United States. The relevant rule being cited from the Law on Higher Education says that a candidate must hold a doctoral degree and have at least five years of experience in a management position, either as faculty dean or the head of a university office to qualify for promotion as chancellor. Since Thành has only served as vice chancellor of Hoa Sen University since January 2017, he is not qualified for the position as per current laws, no matter how strong his academic profile and background, the department contends. Born in 1962, Thành earned his PhD in computational chemistry from the University of Minnesota in 1990. He taught at the University of Utah between 1992 and 2002, and served as president of HCM City’s Institute for Computational Science and Technology from November 2007 until June 2017. His experience in both the United States and Viet Nam would make him an ideal candidate for the university’s top job, one would have thought. Our bureaucrats think otherwise. One wonders whether they thought of, or bothered about, the wider ramifications of their rejection. The rejection has made headlines in Việt Nam for several days, and the general reaction has been one of surprise and anger, stirring up fresh criticism against such rigid interpretation of regulations at a time when serious efforts are being made to encourage talented citizens and diaspora to return home and serve the country, particularly in improving the quality of higher education. In Professor Thành’s case, the question of his competence to lead a university does not arise. His record is one that would attract and inspire younger generations to achieve similar excellence and serve their home country. Will they think the same now? While the department’s rejection can be seen as objective and rational from a very narrow point of view, education expert Phạm Hiệp says there’s no clinching evidence that shows a person with five years of management experience can automatically perform well as a chancellor. Director of the Education Ministry’s Higher Education Department, Nguyễn Thị Kim Phụng, admitted that the regulation on appointing university chancellors has its limitations. “The regulation is not suitable for some cases and it cause difficulties in choosing talented people for such positions,” she told the Vietnam Television. There are so many factors that have to be assessed in a prospective candidate for a university chancellor’s position, including professional capacity, educational background, experience, ethical standpoint and so on, but to stand rigid on the minimum five years of experience in a management position, either as faculty dean or the head of a university, has not served the purpose of the rule, which is to get properly qualified people in top positions. Instead, in this particular instance, it has done the opposite – rejected an obviously qualified candidate. In many developed countries, a university chooses its leaders on its own, based on different conditions and requirements, depending on each development period. The focus for each period can differ. It can be fund raising, for a certain phase, political and diplomatic outreach for another phase, and boosting enrollment for yet another phase. So a chancellor is not necessarily one who has years of working experience at a university. A university can even recruit a person from outside to work as a chancellor because he/she has relevant experience and skills required for that particular phase. And it is not just the education sector that does this. The health care sector does the same. Many hospital directors are not doctors. They could be lawyers or specialists in hospital management. Thành’s case highlights shortcomings in Việt Nam’s policies to attract talents from overseas to work in the country. The professor said in a Facebook post that he has set aside his dream of supporting the development of Việt Nam’s higher education to return to the US and take up his old job at the University of Utah. There is still a big gap between our policies and reality. Such cases show that many preferential policies adopted can run into a brick wall of rigidity. We have to remember that ultimately, in such failures, it is our students, our younger generations that lose out. We should understand why only one of the 15 winners of the “Road to Mountain Olympia’s Peak" quiz shows has come back to Việt Nam to work after graduating from universities in Australia. Many overseas students, especially research fellows, choose not to return to Việt Nam, so that they can work in really professional environments, where they do not have to constantly think of making ends meet or rely on unprofessional, non-meritorious factors for career advancement. A report prepared by the Ministry of Education and Training some years ago showed that a shocking 70 per cent of students studying abroad did not return after graduation. The report made headlines in all local newspapers, but there has been no slowing down of the brain drain. The 2018 Global Talent Competitiveness Index, published in January by INSEAD, the Business School for the World, ranks Việt Nam 87th out of 119 surveyed countries. Switzerland leads the rankings, followed by Singapore. The report is a comprehensive annual benchmarking measuring how countries and cities grow, attract and retain talent, providing a unique resource for decision makers to understand the situation and develop strategies for boosting their competitiveness. Professor Thành’s case should be taken as an opportunity for policymakers to review regulations as well as their interpretation. We need flexible laws that can be interpreted and implemented in ways that would meet their actual objectives.